Every year I get many folks asking questions regarding their pomegranate tree or bush and why isn't bearing any fruit. There are several reasons why and things you can try or do to get the fruit coming. Know that you don’t need more than one pomegranate tree. Pomegranates are self-fruitful but the flowers must be pollinated for the tree to bear fruit. If you have an established (4 years and older) that is not producing any fruit, the first thing you need to determine is what type of pomegranate you planted. There are two basic types of pomegranate: fruiting, which bear fruit, and flowering, which bear only flowers and no fruit. Needless to say, if yours is a flowering variety this explains the absence of fruit, and there's nothing that can be done to make it bear fruit. There are many varieties of fruiting pomegranate. 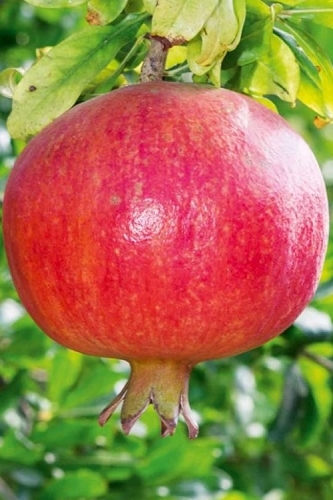 'Wonderful' Pomegranate is probably the most well known of pomegranate varieties. We sell more of the 'Russian 26' Pomegranate because it is one of if not the most cold hardy varieties. If you have a proper fruiting variety but it has not born fruit, or the young fruits are dropping, there are several possible problems, but not without solutions. Read on to find problems and solutions. The pomegranate is both self-pollinated and cross-pollinated by insects. This means you only need one pomegranate bush or tree to get fruit. There is very little wind dispersal of pollen so most of the pollination is done by bees. So, if you have a pomegranate tree that is not producing fruit, the most likely explanation is a lack of pollinators. If there are few if any bees around during the bloom period, there are two things you can do to solve the problem. The first solution is to enhance pollination is to attract more bees nd other pollinating insects. The best way to do that is to plant more pollen-heavy flowers in your garden. Also add a bird bath or other water feature to your garden for bees to drink from. Last but not least, don't spray the flowering plants in your landscape with a harmful pesticide. If you must spray, use Neem oil and spray early in the morning or late in the evening when bees are not active. The other solution is to hand-pollinate. To accomplish this you can use a small artist-type paintbrush or a Q-tip (cotton swab) to transfer pollen from the male stamen to the female ovary. This is best done in the early morning hours. Start the hand-pollination process by locating flowers that are open, with pollen that is ready for transfer. Then Use the brush or swab to gently swirl around the stamens. 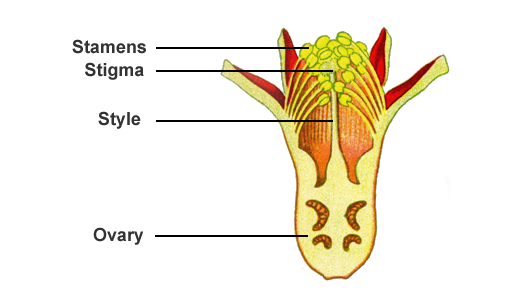 Carefully swirl the pollen collected on the brush onto the stigma, which is the knob atop the style and nestled among the stamens. More simply put, just make sure to touch all surfaces around the middle of the flower. If you have multiple trees, go from tree to tree to cross pollinate, which will increase the crop. The difference between pomegranates and many other fruit trees is the wide range of soils in which the pomegranate will grow. From heavy clay, black loam, lime rich soils, dry rocky hillsides to sandy soil, the pomegranate will grow almost anywhere. That said, though pomegranates will tolerate most any type of average garden soil, they grow best in fertile, deep, loam soil that is rich with humus, as do most other fruit trees. Pomegranate prefers a well-draining soil. Constantly soggy or wet soil can cause problems with their roots. Brief periods of flooding won't cause problems provided the soil is well-draining. When growing on quick-leaching sandy soil pomegranate will require additional fertilization for good fruit production. If you are uncertain about soil drainage in the area you intend to plant a new pomegranate, it's well worth taking the time to test the drainage before planting. 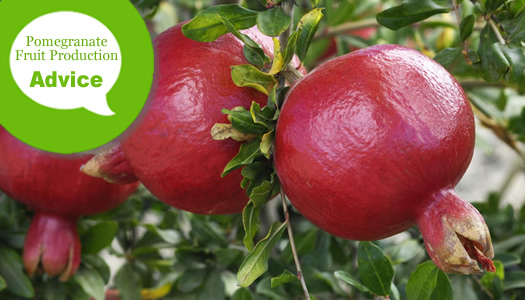 If you're unsure about the pH of your soil, or whether or not it is suitable for growing pomegranate trees, it's a good idea to test the pH in the planting area. You can quickly test soil pH with an inexpensive soil pH tester probe. To raise the pH (make more alkaline) you can add pelletized limestone to the soil. To lower the pH (make more acid) you can apply Soil Sulfur, Aluminum Sulfate, or Chelated Iron. Adding organic compost to the soil or using compost as mulch can also help to increase acidity and maintain acid soil conditions. The best and most fruits will be produced when pomegranate trees are growing in full sun. However, trees that receive a little shade during the hottest part of summer days will still produce good crops of fruit. I suggest at least 6 hours of direct sunlight per day. Your pomegranate might be getting too much nitrogen, which is first of the 3 numbers on a package of fertilizer, and not enough bloom ingredients: phosphorus and potassium, which are the 2nd and 3rd numbers. Due to the fact that most lawn fertilizers contain high amounts of nitrogen, pomegranate trees growing in a lawn are highly susceptible to over-fertilization with nitrogen. To solve the problem, create a mulched bed around the base of your pomegranate tree. Because the feeder roots of your pomegranate tree can extend well beyond the branch perimeter (drip line) of your tree, extend the mulched area 5 or more feet beyond the branch perimeter. Then avoid spreading lawn fertilizer over this mulched area. 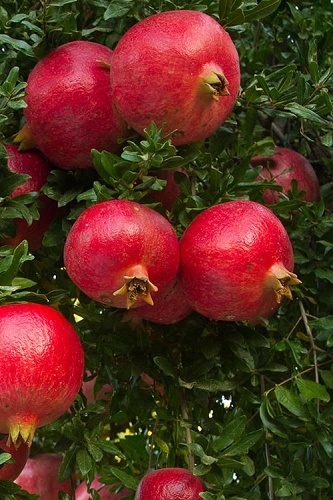 Unless you have a very sandy soil that doesn't hold nutrients well, Pomegranate plants need very little fertilizer. Don't fertilize your Pomegranate at all during their first year of life. Starting in the second year, Pomegranate trees can be fed as directed on the product label with an organic plant food or an inorganic fertilizer such as a slow-release shrub & tree type fertilizer. Alternatively, Pomegranate can be fed simply by mulching with organic compost. The type of fertilizer you choose is up to you. Spread fertilizer from a point a foot or so beyond the trunk to 6 inches beyond the branch perimeter for every foot in height of the tree. Caution: Keep in mind that too much fertilizer is bad, so it's better to apply less than more. Too much fertilizer will cause heavier foliage growth, which can effect fruit production and even cause the fruit to drop prematurely. Applying too much fertilizer or applying it later in the year than recommended can cause fruit to mature late, and have poor color and poor taste quality. Pomegranate trees flower on new wood (the current year's new growth). An annual pruning during the first 3 or 4 years helps to encourage lots of new growth, which in turn creates a bushier tree and more flowers and fruits. In early spring, just when new leaves begin to emerge along the branches of your pomegranate tree you can give the tree a pruning. If the tree didn't grow much during the previous year, maybe snip off just 6 inches of the tips of all branches. If you have a vigorous tree that grew a lot, cut off a foot or two of the branches. This pruning will encourage the tree to make lots of new growth. Water is the most critical nutrient for establishment of young Pomegranate trees, particularly during the first year after planting, and is very important for established trees. For established trees, adequate irrigation, especially during dry periods, is very important to improve growth, fruit set, yield, and fruit size. Fruit will drop prematurely and will split if trees are not getting enough water during dry spells.